Create beautiful and tasty decorations with the help of this Ateco 4200 9-piece / 18 shape sculpturing set. Made of durable, food-grade plastic for excellent reliability, these tools are perfect for forming, marking, or imprinting your figures and decorations. Whether you're making fondant ribbons, gum paste figures, leaves, or flowers, this set will help bring your artistic designs to life! Once the initial layer of fondant or gum paste has been formed and shaped, this set will help you take your designs a step further and add another dimension for a more finished look. We use these tools everytime we make 3D fondant figures. They work fantastic and we have ordered more now for our employees. Ateco is a great cake decorating brand and this is a great price for these! The Ateco 9 Piece Sculpturing set is amazing. We use it everytime we create fondant pieces. I highly recommend this set from ateco because it hasnt failed us yet! I love these packs of tool. I use them alto and tend to break them but for the price it’s quick and easy to replace them. These tools are a must have for every Baker. You pay for 9 but it's both sides so you actually get 18 shapes. 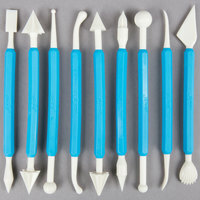 You can basically make any design using these tools for fondant/ gum paste. The quantity is very sturdy. I've had them for 1 year now and I use them a lot. They look as good as new. This is a MUST!!! You must have this to work with fondant and gumpaste, very easy to work with amd sturdy. I promise this won't break!!! Love it! Couldn't be more happy with this set. This item is a must have for any fondant work . With so many different fondant tools the decorating possibilities are endless. Sturdy construction and easy to clean. This sculpturing set is a time saver. You have every tool you need with this set for any design you are attempting. I would highly recommend this set. You can never go wrong with Ateco sets. This is a great addition to my baking department to make all those great birthday cakes for our customers. As an amatuer baker, this set provided me everything I needed to cut the fondant for my daughter's birthday cake. The tools are also very easy to clean. I'm an amateur cupcake decorator...I just decorate cupcakes for my nephew's birthdays or occasional special family events. I'm not sure how to use all of the different sculpting tools, so I usually just use the ones with the balls on the end or the knife shaped one. These are great for making those little details look nice, instead of using kitchen utensils or just my finger. They're easy to clean and have held up well over the years. Maybe one day I'll look into how to use all the other tools so I can do some fancier things with my cupcakes. I am really pleased with this sculpting set. I have only used them once so far but they are very easy to use and you can get great detail with them. These Ateco 4200 9-Piece / 18 Shape Sculpturing Set (August Thomsen) are very nice and easy to use. I had only used the ball so far and was very pleased with the results. Great price and worth the buy. WOW THIS 9 PIECE DOUBLE ENDED SCULPTING SET BY ATECO IS REALLY NICE..BE CAREFUL WHEN WASHING THEM AND BE CAREFUL WHEN HANDLING THEM..THEY ARE QUITE SHARP..MADE WELL,QUITE STURDY,HEADS SEEM WELL SECURED...GOOD PRICE TOO! This is a great durable set by ateco. Having 18 uses in only 9 pieces is great. These are durable and comfortable to hold. They clean up well and are very handy to have in my cake tools. These work GREAT! I highly recommend these fondant tools. They are great for the small detail on your cake or sugar cookies. They cut well too. I have a set of these sculpting tools from another brand and they keep snapping at the head. I have used these only once so far and I already feel the difference in quality. I'm so glad I purchased this set. There are also a few tools in this set that I haven't seen in other sets, which makes it a bit more desirable. Well worth it! I love these tools. I use them primarily when making gumpaste flowers, but they also work great with fondant and modeling chocolate also. I have found a lot of different uses for them. This set has saved me so much money and is awesome for beginner cake makers and decorators. Each tool lets you make a different design and is unique. Used these for multiple cakes and they've never disappointed me. Really great set of tools for working with fondant, gumpaste, or modeling chocolate! Thin edges with the ball tools, open up flowers with the umbrella tools, make flowers and leaves look realistic with the veining tools, etc. User friendly for beginners! I especially love this Ateco 4200 9 Piece/18 Shapes Sculpturing Set (August Thomsen) because it come with a variety of tools in one set with one great price. Easy to wash and store- Great product! Great set for working with gum paste and fondant! Ateco always has a good product and Webstaurant had it for the best price. You won't need any additional fondant tools other than what's included here. I haven't needed to buy any additional sculpting tools since I bought this set. This is a great basic set for working with Fondant. All of the tools have held up well with nothing breaking with heavy usage. If you work with fondant you will love this set. I'm so happy I found this sculpting set. I use it to make figures out of fondant. It helps smooth edges and make imprints where necessary. Great for use in pretty much all my fondant designs, but I love using these with gumpaste flowers. Very affordable compared to other brands, same great quality for a little bit less! This set is not only beuatiful because of color, but very useful for you to make gum paste flower. I made a lot of flower easily with it. I bought these for creating texture on fondant. There is plenty of variety in this tool set and the small instruction card provides useful ideas for how to use some of the odd shapes. Easy to clean. I have been wanting these sculpturing tool set for years. These makes making flowers and art on cakes a breeze. Great for working with gum paste and fondant. this is a very good and sturdy sculpturing set for beginners and pros. great way to use and learning to how shape different types of decoration like flowers. A great all purpose set for forming and shaping gum paste and fondant figures. Easy to use to add details and to thin out flower petals. Ateco shapes and sculpturing set is a good product. I played around with it a few times but still haven't got the hang of it yet.